Something amazing is happening near the quiet French town of Treigny in the historic region of Burgundy. 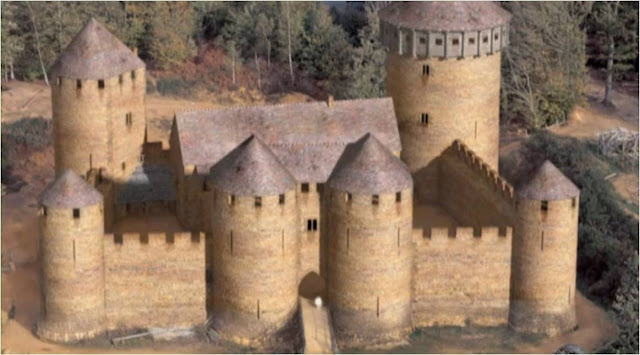 Something that has not been attempted for hundreds of years is slowly appearing – a full scale medieval chateau is being painstakingly built entirely by hand. This is a thirteenth century chateau rising in the twenty first century. It is not a film set for a new Hollywood blockbuster. For a start, which movie director would wait eleven years for their set to be built? 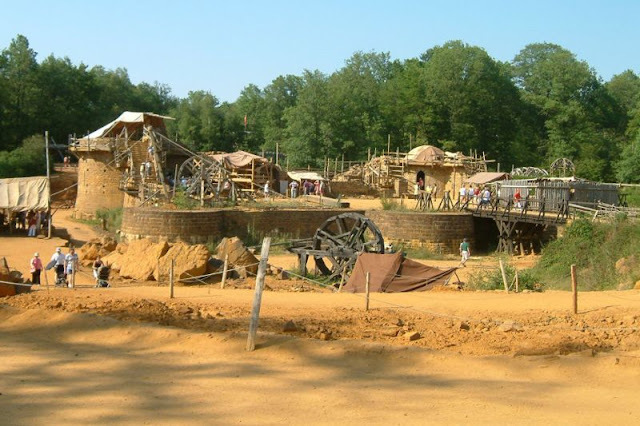 Guédelon was started back in 1999 and it is envisaged that it will not be complete until the mid 2020s.Work, as it happened in the Middle Ages, is very slow compared to modern methods. It isn’t just for tourists either – the area is rich in the real thing, after all. Guédelon castle is an archaeological exercise – albeit one on a particularly grand scale. When it is complete the castle will have a moat, six impressive towers and battlements ready to repel any invaders foolhardy enough to lay a siege. Everything is built using methods from the medieval world. Everyone who works on the site wears medieval clothing too. That isn’t just for effect however; the way we dress informs the manner in which we do things. Keeping it real is everything. 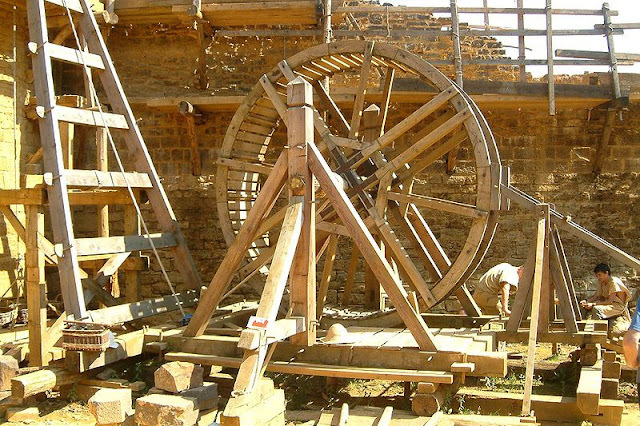 When it comes to lifting heavy pieces of stone then a treadwheel crane is used. This is basically a large wooden wheel which turns around a central shaft. 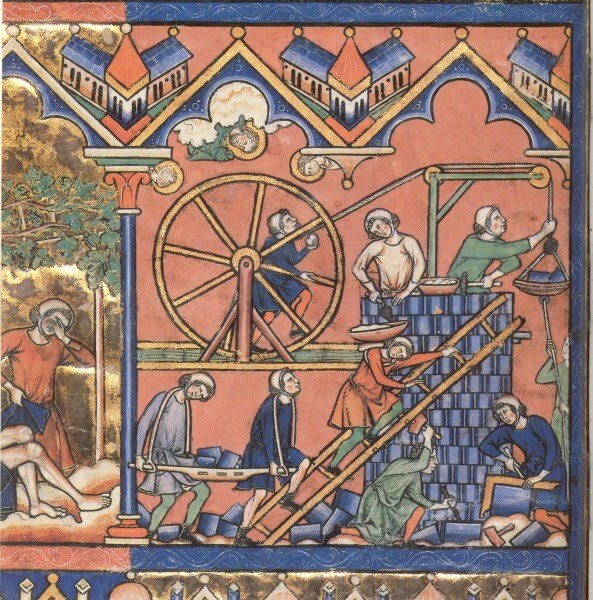 Two workers can stand next to each other on the treadwheel and walk forwards, so enabling large objects to be lifted – vertically at least (not sideways). There are one or two minor adjustments to take in to account the health and safety requirements of our century. Apart from that it is built and used in exactly the same way it would have been eight hundred years ago. The clay used on the roof tiles is mined only yards away from the castle. This mirrors how, where possible, it would have been done hundreds of years ago, decreasing the need for materials to be moved large distances. 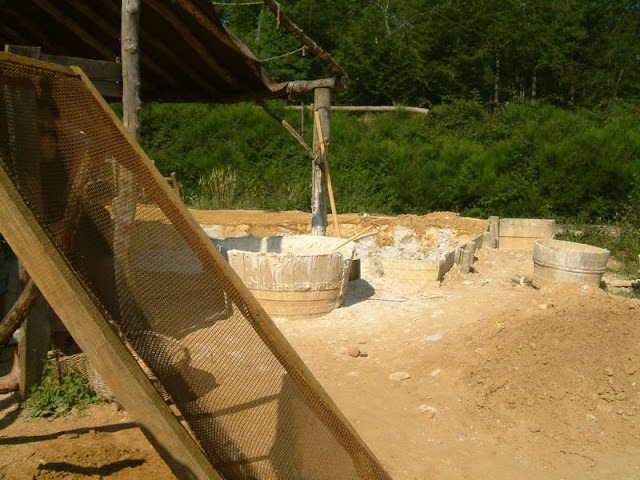 The furnace of the potter, on site, uses medieval techniques. 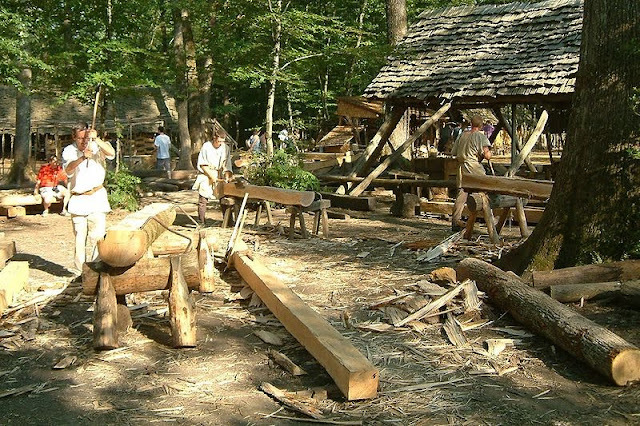 The forge, too, uses only the techniques of the 1200s to create the iron objects needed in the construction work. The bellows (seen above on the left of the Smithy) are something to behold. The rib vaulted techniques that you can see in the roof of the chapel tower have not been used in Europe for over six hundred years. 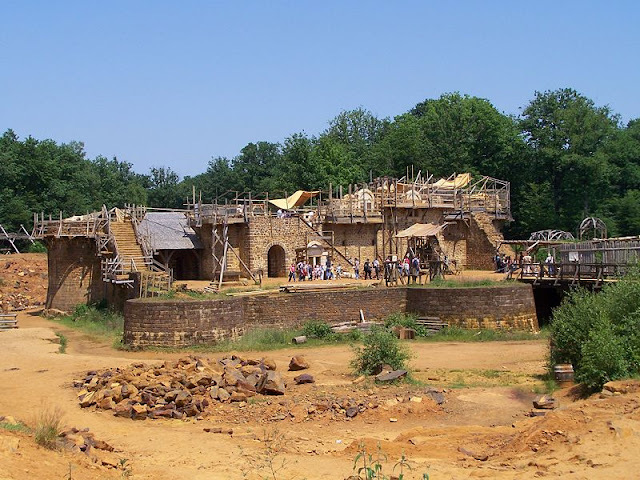 Expensive work, Guédelon was initially funded by the European Union, regional councils and some help from the private sector. 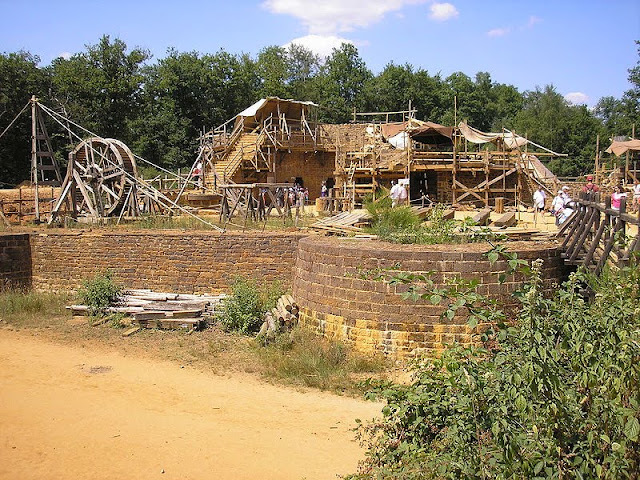 That covered the first year, but for the last ten Guédelon has funded itself by charging an entrance fee. Little known outside of France the castle still boasts a huge amount of visitors, over 300,000 in 2009 (making it worthwhile visiting early in the morning before the those clad in twenty first century clothing somewhat dim the experience). Visitors can wear what they will. Workers on the site on the other hand cannot wear modern items such as watches although they can get away with spectacles if they are needed. The principal room still has some way to go before it fully recreates the splendor of medieval life. However, when the chateau is complete the builders will have a decision to make. In the 1200s castle walls were plastered over and painted. You might imagine a Camelot white to be the color of choice but many castle walls in the Middle Ages were magnificently gaudy. Should the builders allow this old misconception to remain or should they do a rainbow job on the chateau? That remains to be seen and the decision, to be honest, does not have to be made for at least another decade. While there is a wealth of historic chateau in France, some of them in the process of falling down: this is the only one you can see actually going up. Si vous parlez Français, voici encore plus d'informations sur ce projet étonnant. You may also like our new sibling site? Any pics of yourself with celebrities to share with the world?